The Hemingway Foundation - A site from Oak Park, Illinois - the birthplace of Ernest Hemingway. The Unofficial Home Page of Ernest Hemingway. 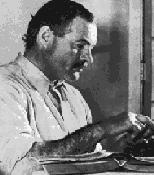 Authors - This page has a quote from For Whom the Bell Tolls and several other Hemingway-related links. IMS' sound archives on Hemingway. - Hemingway's Nobel Prize speach is among the set of Real Time Audio files that can be found here. The Running of the Bulls - A Spanish link to the Bull Runs. The Bull Fight - A description of what to expect at a Spanish bull-fight. Les Deux Magots - One of Hemingway's hangouts while he lived in Paris. Longchamp race track - Hemingway used to love frequenting the tracks in the Bois de Boulogne distrcit of Paris. Sir Hans' Hemingway Quotes - A good site for lots of quotes by Hemingway. A Clean, Well Lighted Place online at Anamorph. The Hemingway Review - is published twice a year by The Hemingway Foundation and the University of Idaho Press. Hemingway's Banned Novels - A page dedicated to the history of banned books around the world. Young Writers' Scholarship - Searching for Papa Hemingway. Hemingway Collection - A very complete list of Henry and Cohn's LARGE collection of Hemingway original artifacts. The Hemingway Bookstore - A collection of books by and about Hemingway, including ordering information...great resource! The Autor... Author... page - A useful list of classics on-line. All pictures used are property of JFK Library, Scribner's Sons or A.E. Hotchner.